Tomorrow B and T will go to their first “solo” swimming lesson. No more mum and daddy to hold them and make sure their are safe. We will be by the side of the pool, but we won’t be needed in the water anymore. If you have read the previous post “Just keep swimming”, you already know how important swimming is for our family. We don’t do it to keep fit or so that the boys can become Olympic swimmers, we do it because it’s our family activity. We love the individual time we spend in the water with each twin and the together time when all of us have a shower and get dressed. We love it! 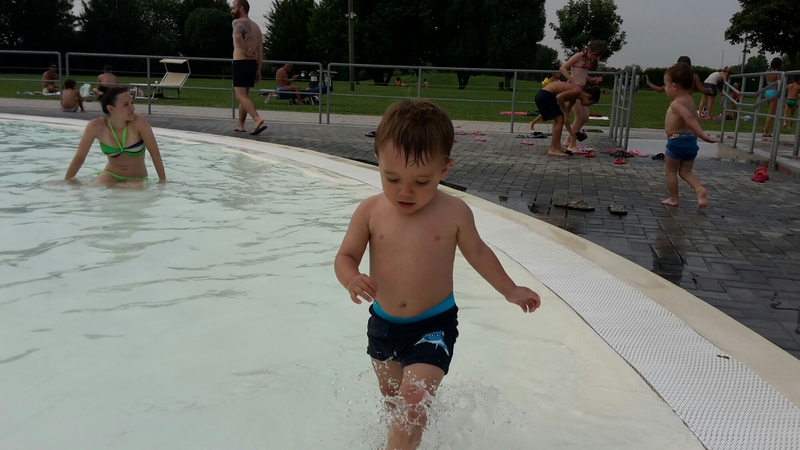 We started when the boys were only 5 months, so it has been over 3 years now… rain or shine we have always been in the pool on a Saturday morning. They have grown so much in this time! I still remember having to give them a bottle of milk after the lesson as they were starving. They still ask for a snack now, but certainly not formula milk! We moved from baby swimsuits to swim nappies to children swimwear. Mostly importantly of all, we never had a poo in the swim nappy! A true miracle. At the end of their last lesson (only B was present unfortunately), the swim teacher gave B a huge hug. She was sad about them moving on, like a primary school teacher at the end of year 6. I almost cried. It is amazing how in all these years, we didn’t simply teach them a life skill. We didn’t simply spend time together as a family. Looking back at each kick and dive, it now feels like the boys were learning to swim (almost), while we were learning to be parents… almost. Not only people think “New year, new me”, but swimming pool management too. From January a new class appeared Ducklings Discovery. Supposedly from 18 to 36 months. 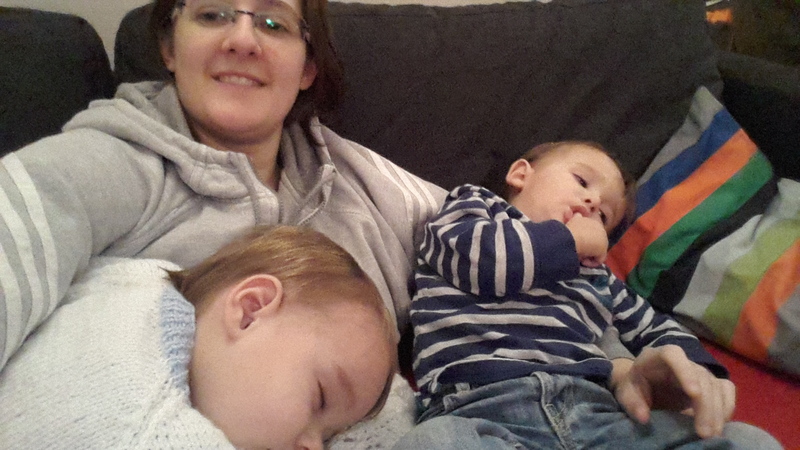 My 28 months old boys should have been fine… wrong! The class exercises required all children to touch the bottom of the pool (75cm deep). B, at the vertiginous height of 85cm, could touch but not breathe at the same time! We joined in anyway and we had fun. B did all of his exercises balancing on my knee and he loved it. Actually T, who at 94cm could touch easily, was less than impressed with the difficulty of the exercises.The class was obviously aimed at preschoolers, not at little toddlers. 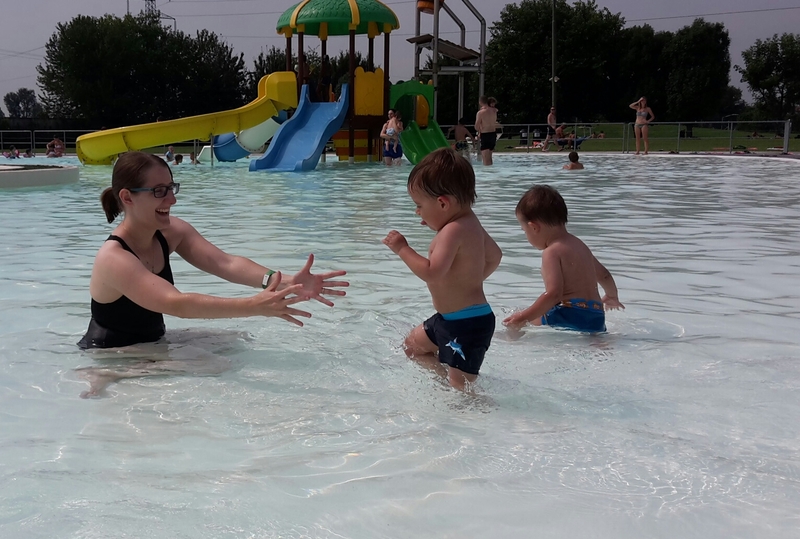 The instructor was a little concerned about the new addition to the class and relieved when they didn’t cry… They are not 5 months old babies at their first experience of water, but she treated them as such. I guess I might do the same if a 7 year old randomly joined my GCSE Chemistry class tomorrow morning. She also looked worried about B when she realised they were twins and she even enquired about his health and why he is so small. My husband wanted to reply “we just don’t feed him as much! ” but his serious side had the better of him… fortunately. We are back in our usual class now and very proud to be part of Ducklings 2. We have a lot more things to learn before moving to a higher class permanently. We have to learn to make some bubbles, kick our legs, remember how to use a pool noodle, but most importantly we need to remember to feed B! The twins and I are on holiday in Italy to see nonna. The weather is as usually sunny and that inspired me to organise some water play at last. On the first day, I didn’t have time to inflate the paddling pool, but with a temperature of 30°C I had to think outside the box. I collected some old washing up bowls from the laundry room, I found some measuring cups and I even froze some water and food colouring to form coloured ice cubes (my Pinterest addition is out of control). The result was a fun hour of water play. The boys loved transferring water from cups to jars to bowls and back again. On the other hand, they couldn’t care less about the coloured ice cubes! Good to know so that I can save some time in the future. I think that the best part of it all was seeing the boys playing together and not fighting. Maybe it was the lack of trains, which are usually the source of many arguments, or maybe it was the availability of more bowls and cups than they could possibily use. Whatever helped, it provided mum with a much deserved break. After all what is difficult about being with the boys is not playing with them, it’s not watching cartoons, it’s not cooking for them… it’s breaking the fights! The interminable fights! Water is an excellent toy. It doesn’t stain, it cools you down and there’s plenty to go around. Thank God we are on holiday in a very hot country, so yesterday we took the boys to a water park with slides, sprays, bubbles and an amazing pool. They didn’t fight once! I love a day spent without toys, as it means a day without arguments. Parents of single children can’t understand this, they love toys! Their lonely child doesn’t have anybody to play with, but also doesn’t have a brother ready to steal his toys as soon as he turns. The single child doesn’t know what it means to fight to be able to get one more piece of Duplo. He doesn’t know that sometimes screaming is not enough… biting is a much more powerful weapon. It must be so easy having only one child… I can only imagine! 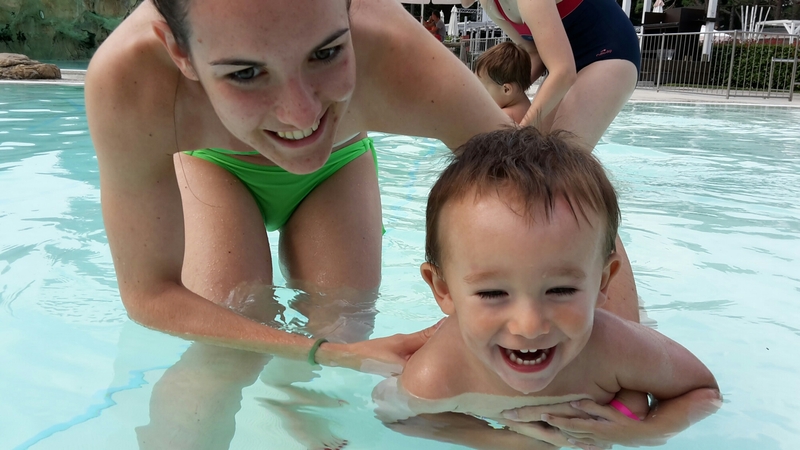 The boys have been attending swimming lessons since they were 5 months old. It’s part of our weekly routine now and we are used to it, but we shouldn’t take it for grant it. There are so many reasons to go swimming with toddlers, I can’t understand why most of my friends stopped. Where to start… The obvious one, swimming is an essential life skill. Compared to most activities is not too expensive. It’s the only “sport” you can do before the age of 1. Better start them young! It improves gross motor skills and built confidence. The first time B held on to the side wall by himself he looked like he just won the lottery! And most importantly it tires them out, which implies a longer afternoon nap! Excellent to catch up on your housework or maximise on cuddle time on the couch. Despite all these reasons, for us the original idea behind the swimming lessons was very different. We started the lessons in a time in which I was feeling very isolated. I was still on my maternity leave and I was home alone with the boys for hours and hours every day. Despite signing up for a thousand baby and mum courses, I still felt like nobody could relate to what I was going through except for a couple of other twins mums. On top of that, my husband and I only had one type of conversation “at what time does my shift start?”. T was still not sleeping through the night, in fact he was waking up every couple of hours. We were tired, stressed and occasionally desperate. We needed something to do together. Something to do as a family. After all we were starting to believe we made a mistake and we didn’t really want a family anymore. It wasn’t how we pictured it (it never is) and we couldn’t see when or even if we would ever be that nice little family we dreamt of. Swimming came along as a desperate way to force the four of us to do something together every week. And it worked! We love swimming now and we wouldn’t miss it for anything in the world. It gave us a chance to see how our unit of four could work. Although it was only for 30 minutes a week. Those were 30 minutes without nappies, feeding, screaming and moaning. It was a small window into the future. Now that we reached that future. Now that we are a nice little family. Now that we can finally sleep. Now that our conversations are back to normal… Now I can finally write about this. And like Dory said in Finding Nemo… just keep swimming!